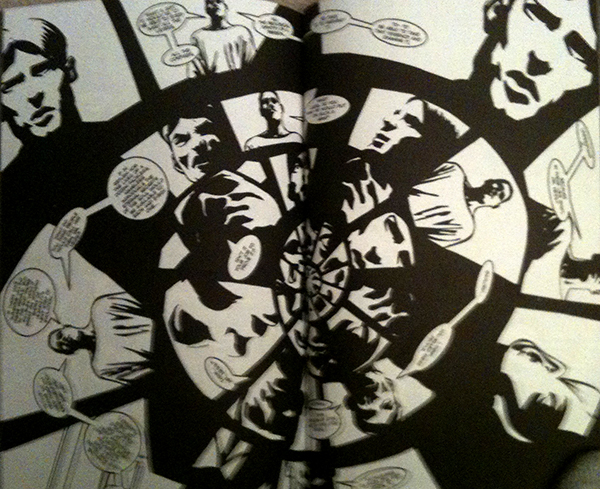 Another atmospheric element Bendis brings into the design is the spiraling pattern of the panels on some of the pages. Maybe this is to show that things are spiraling out of control, or spiraling down the drain. It pulls control away from the reader, in that one has to turn the book to read it properly. It’s a little heavy handed and a little annoying, but I like the experimentation anyway. This entry was posted in Uncategorized and tagged Bendis, graphic novel, Torso, true crime. Bookmark the permalink.